Fire retardant paints and intumescent coatings are vital to ensure the safety and fire resistance of timber and plasterboard surfaces. It’s also essential to meet British safety standard BS 476 when it comes to fire regulations for domestic and commercial buildings. Fire rated paint and fire stopping products can be the difference between people surviving a fire or not being able to evacuate in time, as it gives a time delay between a fire starting and spreading. Rawlins Paints stock one of the UK's widest selections of fire retardant paint for wood, timber and plasterboard, including coloured and clear coatings to provide Class 0, Class 1, 30 minute and 60-minute protection from fire. All our intumescent paints for wood include application instructions, certification, and most can be applied with no specialist training. If you’re looking to fireproof plasterboard or find the best fire-retardant paint for your walls, then have a good look through our product pages. If you’re unsure which product would best suit your project, don’t hesitate to get in touch with our Technical Team on 0113 245 5450. The two main types of fire paint are fire retardant paints and fire-resistant paint. Fire resistant paint is also known as intumescent paint. 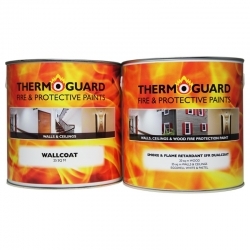 Fire retardant paint most commonly stops fire and flame spreading over a surface by releasing a gas when they get hot. They can be applied to walls, ceiling and floors, masonry, timber and plaster and, depending on the environment, must comply with certain standards. For example, if you are using fire retardant coatings for wood trim in a hotel, they would need to meet current legislation. Intumescent paints, on the other hand, swell up when they are exposed to fire. This creates an insulating coating that protects the material underneath from the flame. Fire retardant wood paint can be used on lots of distinct kinds of wood surfaces, including softwoods, hardwoods, chipboard and work well on doors, panelling, cladding, interior and exterior surfaces of industrial and domestic buildings. We stock a range of fire retardant base coat paint products that can be covered with your own choice of paints. Some branded basecoat wood paint should be used with the accompanying topcoat for best results. 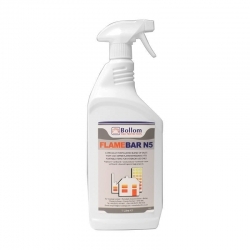 For example, Bollom Broflame Ultra Basecoat paint should be used along with Bollom Flameguard Ultra Topcoats to give a decorative yet fire proof coating to the surface. Broflame gives a Class 0 rating when used on solid timber, particle boards and timber-faced boards and is perfect for communal areas in public buildings, such as schools, waiting rooms, offices and municipal buildings. 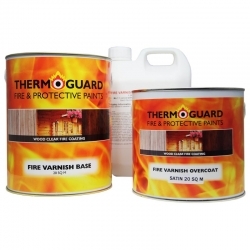 Thermoguard Fire Varnish Basecoat is a clear varnish for wood surfaces, used as the first coat of a two coat system. When used together, they protect wood and timber substrates to Class 1 and in some circumstances the Thermoguard Fire Varnish System can cover 30 and 60 minutes’ fire resistance. 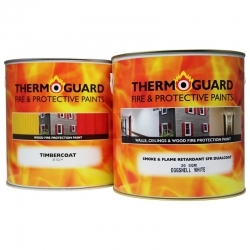 Thermoguard Timbercoat is a fire protection paint for exterior and interior timber surfaces. It’s durable and weather proof and protects to Class 0 and Class 1 Surface Spread of Flame. It’s also possible to use it to achieve 30 and 60-minute fire resistance but please contact our Technical Team for more information before purchasing. Timbercoat is available as a white wood paint only, as it’s a basecoat as part of a wider system. The other part of the system, Smoke & Flame Retardant Dualcoat, has a Matt or Eggshell finish in white and assorted colours to ensure a high quality decorative finish. See here for the complete colour range. For external areas or areas prone to damp, you’ll need to apply two coats of Thermoguard Smoke & Flame Retardant Dualcoat to ensure protection. As well as our fire-retardant systems and basecoats, we also offer clear fire retardant fluid treatments that soak into the wood. These give all the safety benefits without altering the outer appearance of the wood surfaces. 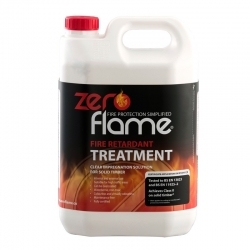 Zeroflame Fire Retardant Treatment achieves Class 0 Fire protection and Spread of Flame on solid timber and can be used on interior or exterior timber. Thermoguard Thermoproof Fluid works in a comparable way, working to protect porous wood, both inside and outside. Thermoguard Thermoproof Clear Sealer also protects wood from the effects of weather, damp and sun damage.